Orchard Road now looks nothing like how it did in the 1830s, when instead of shopping malls, the strip was decorated with gambier, pepper, nutmeg, and fruit plantations. In the late 1840s, graveyards had begun popping up after houses had sprung up along the roads leading up to Tank Road, near modern day Fort Canning Park. Opposite where TANGS now stands was a Chinese graveyard named Tai Shan Ting Cemetery. Creepy, right? No one would want a property located near a place like that. No one, except the late Mr Tang Choon Keng who eventually founded retail empire TANGS. Mr Tang Choon Keng, more popularly known as CK Tang, came to Singapore in 1923 from Swatow, China when he was 21, carrying with him only a tin trunk and a leather case. He was documented to have sold lace and embroidery he brought from his hometown, hiring a rickshaw puller to peddle his wares. In 1932, he started a department store with $3,000, on the first floor shop unit at a building in River Valley, which was considered a “gamble” as his customers were accustomed to him going to them. It paid off and his business flourished enough for him to amass enough to erect a building on River Valley Road. He named it “Gainurn Building” as a tribute to his father, Tang Gan Urn. With that, he expanded his offerings to include jewellery, basket, and various Chinese curios. 26 years later, he bought a 1,351sqm plot of land at the junction of Orchard Road and Scotts Road for $10,000. By then, it was already a million-dollar business. CK Tang believed that it will capture the footfall of British housewives living in the Tanglin area when they made their way to downtown Singapore. He established the flagship C. K. Tang Department Store, and then Tangs Plaza with $200,000, its distinctive architecture inspired by the Forbidden City in Beijing, China. 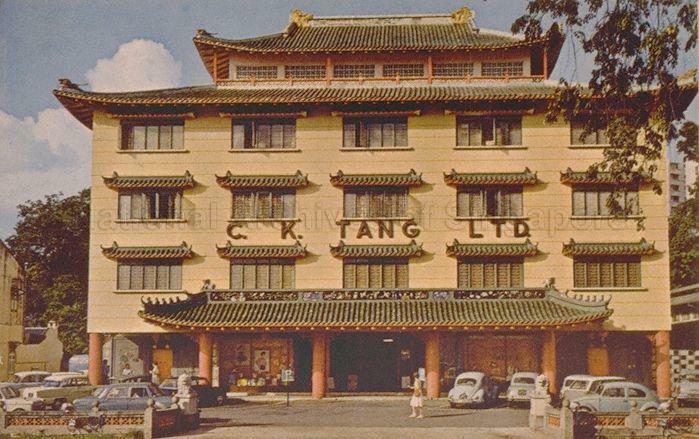 CK Tang then earned the nickname ‘Curio King’ as the department store grew and became known for its selection of quality Chinese goods. It also became the choice store for Western brands that want to enter the Singapore market. 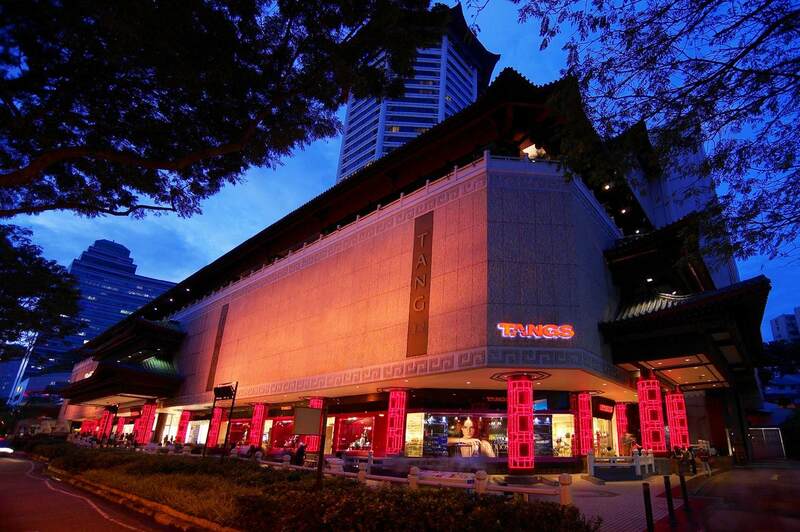 Orchard Road was then designated as a tourist and shopping district, and CK Tang’s business soared along with the astronomical rise of land prices. When it was first opened, the department store had catered to the largely wealthy and expatriate community. By the 1960s, they were recognised for stocking houseware, Chinese jade and products, and Kelantan silver. In the next decade, they became the place to go to get international cosmetics brands like Revlon and Elizabeth Arden. The flagship store grew to 15,000sqm in the early 1980s and adopted the slogan “All The Best Under One Roof”. In 1988, he opened the brand’s first lifestyle concept store, Tangs Studio, at the former Scotts Shopping Centre, and a second one three years later at Ngee Ann City – which failed because it lacked the “intimacy” and novelty the first one had. They have now completely “embraced” the concept and has a whole Studio Tangs. They included menswear and women’s fashion and shoes in the 1990s. 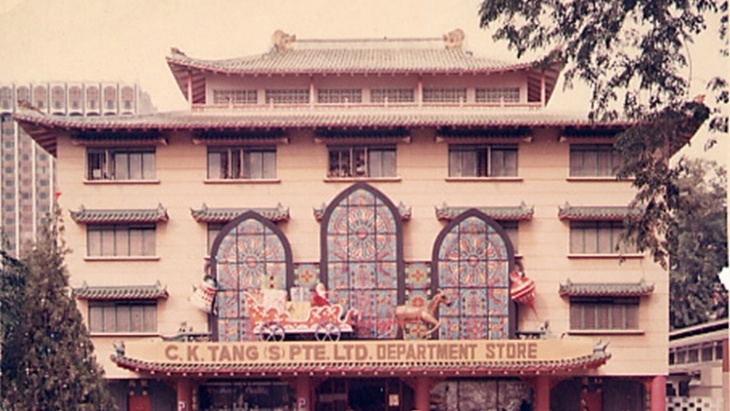 A BBC article in 2000 commented that C. K. Tang was “regarded as a Singaporean shopping institution, along the lines of Harrods in London or Macy’s in New York”. Wee Sung also shared in another 2015 interview that their current target audience has changed to reach the upper middle to lower upper classes, and shoppers in their 20s to 40s. He noted that their “fashion direction in the past was seen as dowdy” so he hired a creative director in the fashion industry who was previously based in Paris and had worked with Harper’s Bazaar magazine, to curate their fashion brands. Kick-off Chinese New Year in style! Check out Vero Moda, one of our newest fashion brands in store, and enjoy 15% off! Regular-priced items only. Conditions apply. . PLUS today’s the LAST day to enjoy 12% Rebate on all your shopping at #TANGSyourCNYstore in stores and on TANGS.com! In 2012, they invested S$45 million and took three years to revamp and refresh the flagship store, bringing in more new brands that complement their contemporary new look. Now, they have gone online, adopting e-commerce and released mobile apps. The 1960s were rife with problems with trade unions as people were fighting for fair wages and working hours. 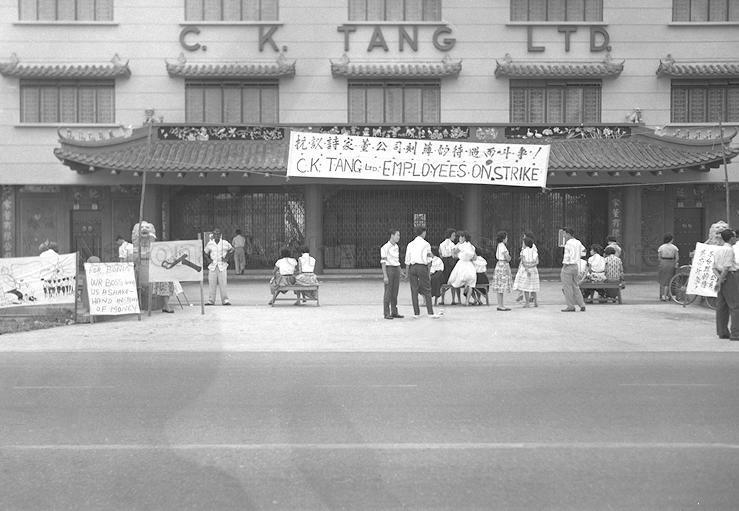 C. K. Tang had thus closed “voluntarily” for a year in 1960, perhaps, to avoid further aggravating the labour movement. His influence grew so much that in the same year, CK Tang was kidnapped, but was released unscathed in 84 hours after the family reportedly paid $150,000 in ransom. In 1975, the founder decided to make the company public, an unconventional move for family-run businesses. Youngest son, Tang Wee Kit, explained to Forbes that his father believed going public would stave the sense of entitlement amongst relatives, noting that they may “come and go, but privileges stay with them”. He clarified that it wasn’t because they needed funds, but rather his father wanted to “avoid family disputes that could ruin the business”, and it makes the family business more “professional”. Wee Kit recalled seeing his father “struggle over taking on debt to finance new construction” because he “didn’t like to owe money”, and revealed that in March 2014, they had “basically no debt in the entire company”. Over the years, the brothers have tried three times to get the business delisted and finally succeeded at their third attempt in 2009. It was valued at $394 million, as stated in a report in 2010 that recorded the sentiments of one shareholder. Forbes Asia estimated the family’s wealth to be worth $1.37 billion in July 2015. Investors were reluctant to let the brothers make the company private as they “thought that the property increase in Orchard Road could mean higher valuation for retail investors”. This had caused much debate in the company as even in 2016, the property had been valued at $476 million by the company’s financial statements, but remaining shareholders were displeased with what they thought was an under-valuation. It was revealed that Wee Sung’s retirement in 2016 “was part of a ‘family succession plan’ that began in May 2006”. 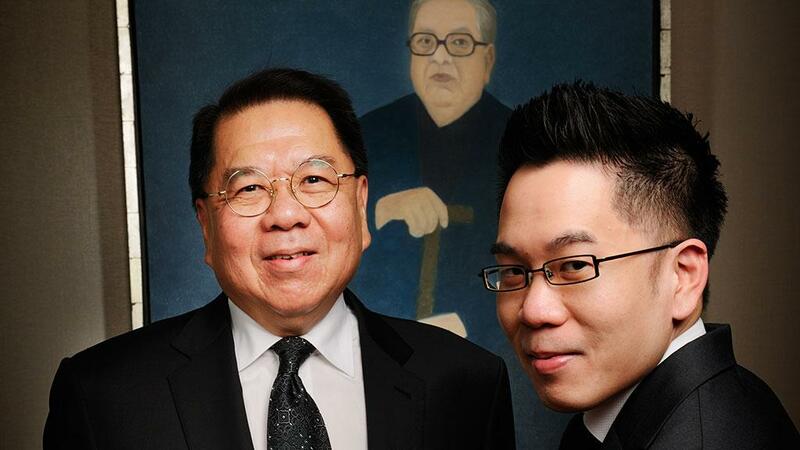 As of 2017, the Tang family holds 98.3% of the shares under Tang Holdings, and the eldest son of Wee Kit, Sean Tang was inducted as the CEO. CK Tang retired in 1987, leaving his sons to take care of the dynasty he created. He passed away in September 2000, aged 98. Wee Sung admitted to reporters that they had “made the mistake of going ‘a little more mainstream’ over the past decade” which resulted in the loss of the young professionals market. 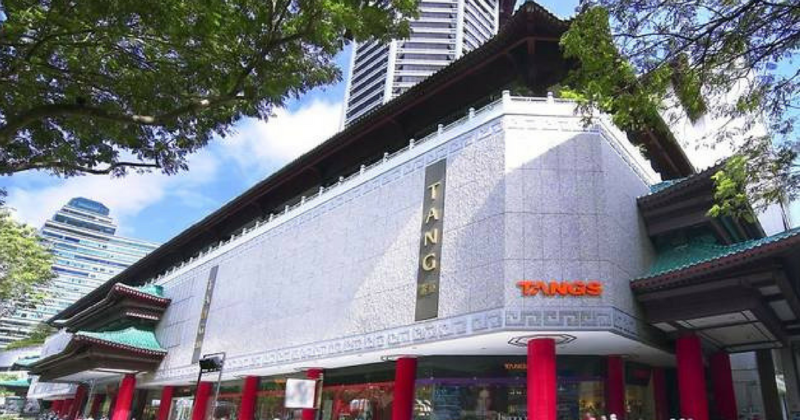 He said that TANGS has to further specialise and differentiate themselves from the likes of Takashimaya and Robinsons, who are larger than them. “In being smaller, the advantage is your offerings can be much more clear and that’s what we are trying to do,” he continued. Receive additional 4% rebate on your TANGS Preferred or Classic Membership! Simply spend a minimum of $100 in a single receipt with your Standard Chartered Credit Card from Friday to Sunday. Visit bit.ly/TANGS-SCB4 for more. Conditions apply. In a conversation with The Business Times, Wee Sung shared that while he naturally wanted to join the family business, he was “thrust” into the position as Chairman. He used to drop by the store every day but has since cut down his visits to once or twice a week, crediting day-to-day operations to the “capable people” in the company. Wee Sung remarked that the Tangs group “was founded upon the core values of honesty, integrity and providing value” and reckoned that he didn’t deviate far from CK Tang’s early visions. “My father’s values are all encapsulated in these statements, which essentially is the recipe of success for Tangs,” he said.